I’m grateful for the brave men and women who risk their lives to save others. Today, I am grateful for the return of sunshine and warmth. I enjoy a little cold and a little rain, but sunshine and blue skies and warm temperatures almost always win with me. I tend not to be the ‘out of sight, out of mind’ type. I’m more inclined to imagine how something bad could happen and what needs to be done ahead of time, or in the moment, to avoid it. So, when a beloved elder of the family drove 300 miles round-trip to attend a funeral, all in just over 24 hours, and there was cold weather and rain at dusk in the forecast for the return trip, I tried to call to suggest staying overnight and returning on a sunny day. My calls and texts did not get through, but my loved one returned home safe and sound and looking wonderful. 🙂 For this, I am immensely grateful. 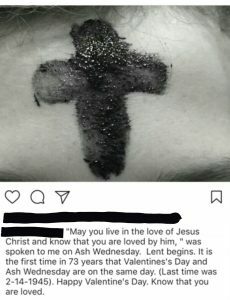 I went to a pancake supper and an Ash Wednesday service last night at my church. It was very informal. Afterwards, someone sent a text message with a photo and a message. My gratitude today is for shared experiences and for people who share things that are meaningful to them. I am grateful for love in all its many forms. Why would anyone be grateful for heartache? Why would anyone be grateful for that sadness that splits the chest open and makes the heart break? Why do we hurt in our physical hearts when our emotional hearts are broken? Isn’t it weird (and sad) that it really is possible to die of a broken heart, broken heart syndrome? Why is there so much brokenness in the world? How many of us are the feeling loss of someone we love who loved us, or rejection by people who never did love us, or disgust by people who think they know us and think badly of us, or ‘hate’ from someone else at any given time? How many people feel truly seen and known and loved? How many people endure bullying throughout childhood (and, sometimes adulthood)? We have all felt this pain at one time or another, have we not? I hope for all of us that our days of knowing we are loved are many more than our days without love. I am grateful for heartache, in a global sort of way, because it brings perspective and it allows me to appreciate those who love me. I do not ever enjoy the pain that comes with being on the wrong end of loss of those who love me or the nastiness some people dish out so well. But, it serves as a reminder that we are all in pain at one time or another, and in one way or another. Sometimes those who are the best at causing hurt are the ones who are hurting the most. As much as most of us here in the US of A work, work, work, we’re also lazy in some ways. We work in a way that is often unconscious and without mindful intent. We spend our lives chasing $$$$, and spending $$$$, often to stay alive, sometimes frivolously, at times to help others. “I often say, ‘I love working, and I love not working. '” I am grateful that I have been able to work enough in my life to provide for myself. I am grateful for the opportunity to work. I am also grateful for the opportunity not to work. I am grateful for local public radio. There are two public radio stations in my town. Both are at local universities. Both provide very satisfying content. Dr. Christina Hibbert says there are 10 benefits of practicing gratitude. Others say there are other numbers of reasons, but this is a good list. She’s written a few lines about each of these 10 benefits of practicing gratitude. There is plenty of information on the internet about gratitude. Many people have written about it. There are blogs and best sellers. There are images and charts and calendars and suggestions.